Shantou is one of Ben Case’s favourite sires so the Edgcote trainer was delighted to see one of his off-spring land the odds. 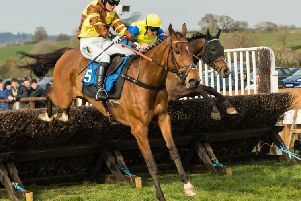 Case maintained his recent good run when Shanty Alley won at Huntingdon on Friday on only his third start over timber. The five-year-old won the EBF National Hunt Maiden Hurdle in the hands of Wayne Hutchinson, taking Case to five victories in the past month, after wins for Coded Message, Kilbrew Boy, First Drift and Ratfacemcdougall. Two of Shanty Alley’s three owners are Jerry Wright from King’s Sutton and Pat Murray from Claydon. The Wardington Gate Farm handler said: “He may have a couple more runs over hurdles this season, but his future lies over fences. The win was a little bit of a surprise, but he did finish in front of the favourite [Precious Bounty] at Hereford on his first run of the season.